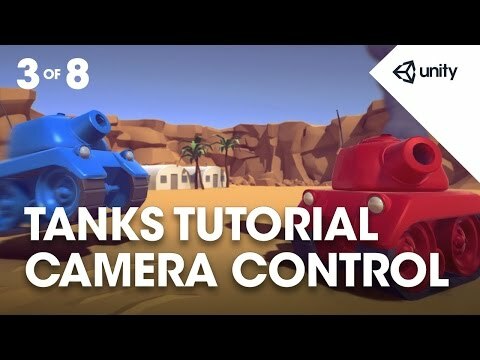 Phase 3 teaches you how to create a Camera which pans and zooms to keep all tanks onscreen at once. order to fit in the two tanks. and we're going to talk all about that now. We need to create what we call a camera rig. for prototyping or something like that. go to any of these other things. And then you've also got a Create menu on the hierarchy. the same as this menu up here. that also allows you to do the same things. button on the hierarchy and choose Create Empty. We're going to rename this CameraRig. making sure that it's first off at 0.
the gear icon to the right of any component. in zeros for you, just slightly quicker. The rotation of that, we want to set it to (50, 60, 0). and you'll see why shortly. should be (40, 60, 0), (X, Y, X). And the position will be just slightly off. so I'm just going to put that where it's easier to read. The position of the Main Camera, (0, 0, -65). so as a result it's rotation is 0. So just to run through those things again. The CameraRig's rotation should be (40, 60, 0). And the camera itself should be all zeros. the X and Y coordinates but it is further back. but no variation in X and y.
to global so you can see it. So you see these axis handles in my scene view? whereas the camera is all the way up here. so Z being blue there. any kind of scripting and functionality. and between those two points is everything that you can see. everything that it's surrounded with. Things, like in the real world, get smaller as they're further away. any change in scale over distance. whereas really they're probably the same height. Whereas in the orthographic view things remain the same. that's the kind of view that you were looking at. as we go through this theoretical part. And we zoom by changing that size. it zooms in and out. fits in so it looks smaller. So increasing the size will zoom out. Whereas decreasing the size will zoom in. of 1920 by 1080 pixels. So what should our camera do? for this next part, okay, so what should our camera do? Well we need to follow the tanks. to fit the tanks on the screen. the camera is zooming out. the tanks never quite get to the edge. We have what we think of as a padding. It's a screen edge buffer. An edge buffer for the edge of the screen. So that's the behaviour that we're going for. and then we'll carry on a bit at a time. and then you'll find a folder called Camera. And there's one called CameraControl. the CameraRig, not the Camera, the CameraRig. I can't say that enough. CameraRig has the CameraControl script on it. Then we're going to launch that script and have a little look. run through it and explain how it works. the DampTime and we've set that to 0.2.
to the position that it's required to be in. and that's how long we want it to take roughly. they're all the way on the screen. I had to get one in! Okay, so the next one is the Minimum Size. so we set a minimum size of 6.5. So next we've got a little bit of a complication thing here. We've got HideInInspector commented out. is hidden in the inspector. it to be one of the targets. want to be able to set it in the inspector so we're going to hide it. 'hey, okay I'm going to set those targets for you. tell the camera what to do'. HideInInspector, so that's what that's going to do. before we've set up the game manager we can still use it. What do you guys call those? Square brackets, of course, we'll call them that. Why can't we say round brackets? You guys! You're killing me. access it's size variable and change it. you don't need to worry too much about them. requires a reference to how fast that's happening. by the function, and that's it. The last one we've got is the DesiredPosition. 2 tanks, so it's just going to be the centre of those 2. Yeah, and we've got a quick slide just to show that. just taking an average of their current two positions. And you'll see that in the script in a little while. So I'll try and explain what I mean by that. tanks aren't there anymore, they're moving around. is going to zoom to the correct size. on a child, so we're using GetComponentInChildred. so it's totally fine to use this in this instance. specific things you might want to use another method. with FixedUpdate and we want to move along with them. move the camera as well. but it's keeping things in sync. So that's the important part to remember that. come back to the script and go through that then. is it calls this function FindAveragePosition. it's going to set the DesiredPosition to that. that we don't really need to know about. reset that variable to how fast it's now moving. The last parameter is the DampTime. So that's how long it's going to take, approximately. So let's look at the FindAveragePosition function. create a vector3 which is blank to start off with. targets so we'll set that to 0 as well. we're using a for loop. which is known as an iterator. i is less than that target's length. And for each loop that it does it's going to add 1 to i.
in it's list of targets. which are inside that for loop'. way of using for loops. until it's as large as it's length. Target's game object is active. So when a tank dies, what we're going to do is deactivate it. we're only doing these things if the tank is active. is continue on to the next iteration of the loop. So we'll go back to here and do the next thing. so it's basically taking that entry in the list. the third time it will be 2, and 3, and so on. is the game object it's attached to active? and we carry out these other instructions. zoom in on the tank that won the round. So it's kind of doing both functions for us. to the average position, so that's that +=. and assign it to the average position again'. we've counted how many active tanks that there are. then divide that average position by how many there is. we've got the position that's between those two points'. where ever that rig is moving. so they shouldn't be moving up and down. that the camera does not move up and down. but that's what that's there for. Okay, so let's talk about zooming. and you've got one in the centre. start and what we've designed so far. the size is what we use to zoom. example of aspect earlier, which was that 16:9.
we can see it on the screen if that's true. is our CameraRig pointing down in to the world. That's the CameraRig's local axis. distance in Y axis is the same as the size. probably need to zoom out. and that's also the size times the aspect. to keep it on screen. relative to the camera, we can work that out. all definitely going to be on the screen'. distance is the same as size times aspect. distance divided by aspect gives us our size. how this zooming works in code terms. pretty similar to the Move function. smoothly damping towards that size. we're storing it in the float called RequiredSize. orthographic size and the required size. of time so we're giving it the same DampTime. zoom over the same period of time. So now the dreaded FindRequiredSize function. not from the current position of the camera. had the Y axis and the X axis shown? so it might be up a little bit and right a little bit. and at the end pick the largest size. and therefore we'll capture all of them'. looping through all the targets. from 0 to just before the length. continue on to the next target. a tank that is active and do something about it. in the local position of the camera rig. that's just the CameraRig's local space. if it's on the right of the screen it's going to be some value in X'. that's the CameraRig's desired position, that's all that's happening here. and we're going to calculate the size. or this new value that we're calculating. Absolute value of the Y axis of that vector. not whether it's positive or negative. multiplied by aspect, so to find size it's distance divided by aspect. things that look like they're doing the same thing to this size variable. They're not, they're basically deciding which is bigger. currently bigger than the Y value. and saves it back to that variable. So by this time size is currently the furthest value. tanks will definitely fit in to the zoom. so we want to apply that minimum size. then we'll choose 0 or 6.5, we'll choose 6.5.
because you would just not be able to see anything properly. and make sure that that's the case. then it's getting that value returned out of it. Okay, so a quick thing to note is this is a public function. So it can be called from outside of the script. find the right size, find the right position and set straight to those. position, setting the Transform.Position straight to that. finding the RequiredSize setting and straight to no SmoothDamp. in the Completed folder, so do have a look at that afterwards. And so let's go back to our slides. we've got one target, one tank. So what we're going to do is go back to Unity. square brackets that we had in the script. so if I expand that I can see Size 0.
items that we can put in to it. to the first element in that list. Okay, so one more time. expanded, it doesn't matter if you do or not. which is our target for the camera to look at. you've got a size of 1 and Tank is listed in there. we have Transform, that's the type that it's looking for. via that and so that tank is the reference it's got. disappear from the inspector totally. The game manager will then populate that list for us. Okay, so we should now be able to play our scene. And drive around, it should look like this. We can now explore our wonderful world. public float m_DampTime = 0.2f;                 // Approximate time for the camera to refocus. public float m_ScreenEdgeBuffer = 4f;           // Space between the top/bottom most target and the screen edge. public float m_MinSize = 6.5f;                  // The smallest orthographic size the camera can be. [HideInInspector] public Transform m_Targets; // All the targets the camera needs to encompass. private Camera m_Camera;                        // Used for referencing the camera. private float m_ZoomSpeed;                      // Reference speed for the smooth damping of the orthographic size. private Vector3 m_MoveVelocity;                 // Reference velocity for the smooth damping of the position. private Vector3 m_DesiredPosition;              // The position the camera is moving towards. // Move the camera towards a desired position. // Change the size of the camera based. // Find the average position of the targets. // Smoothly transition to that position. // Go through all the targets and add their positions together. // If the target isn't active, go on to the next one. // Add to the average and increment the number of targets in the average. // If there are targets divide the sum of the positions by the number of them to find the average. // Keep the same y value. // Find the required size based on the desired position and smoothly transition to that size. // Find the position the camera rig is moving towards in its local space. // Start the camera's size calculation at zero. // ... and if they aren't active continue on to the next target. // Otherwise, find the position of the target in the camera's local space. // Find the position of the target from the desired position of the camera's local space. // Choose the largest out of the current size and the distance of the tank 'up' or 'down' from the camera. // Choose the largest out of the current size and the calculated size based on the tank being to the left or right of the camera. // Add the edge buffer to the size. // Make sure the camera's size isn't below the minimum. // Find the desired position. // Set the camera's position to the desired position without damping. // Find and set the required size of the camera.